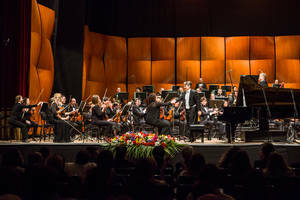 On Saturday 17th March, the Malta Philharmonic Orchestra performed at their best yet again. Two words can be used to describe this performance – simply amazing. Although Glinka’s Overture to Ruslan and Lyudmila, Profokiev’s Piano Concerto No. 3 in C Major (Op. 26) and Shostakovich’s Symphony No. 10 in E minor (Op. 93) are all complex and difficult pieces of music, the MPO has managed to successfully achieve a perfect execution of the challenging pieces. 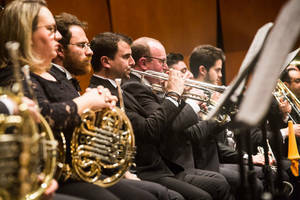 The Malta Philharmonic Orchestra, founded in April 1968, is made up of about 75 musicians. 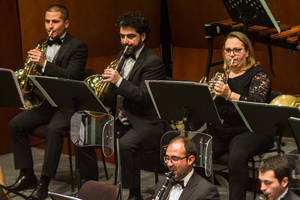 During this concert, the Orchestra was conducted by Michalis Eonomou. The renowned concert pianist Pietro de Maria was guest pianist. Overture to Ruslan and Lyudmilla, by Mikhail Glinka, was the shortest piece. The piece itself was inspired by Alexander Pushkin’s mock-epic folktale by the same name. This overture, written in the 1840s, is an iconic one, indicating a new approach related to national identity. In this 6-minute long overture, emotion was depicted perfectly, through the conductor as well as the musicians themselves. The instruments were synchronised perfectly throughout. It was definitely the liveliest of the three, with quick, sharp notes by the violins fluctuating from loud to soft. Piano Concerto No. 3 in C Major, Op. 26, by Sergey Profokiev, was written and finalised in Brittany in 1921. It is divided into three, Andante – Allegro, Tema con variazioni and Allegro ma non troppo. The main theme is played by the orchestra alone, while the piano joins in during the first variation. This concerto lasted 30 minutes and Pietro de Maria, the guest pianist, played beautifully, and his hands moved swiftly and with ease, even though it necessitates a virtuosic approach. Symphony No. 10 in E minor, Op. 93 by Shostakovich was released in the 1950s after Stalin’s death. This was definitely the most dramatic, powerful, emotional and saddest of the three. The orchestra portrayed these emotions perfectly, and although it was very long, taking about 50 minutes, no energy was lost by the musicians. For the whole duration of the concert, the entire hall was captivated by the orchestra’s performance. The conductor, Economou, was clearly very emotional, and felt every note. 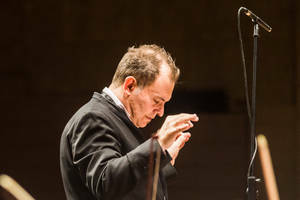 On top of that, Pietro de Maria received what seemed an everlasting applause from the audience, as well as the orchestra. Personally, being a pianist myself, and knowing how hard it is to get to this level of perfection, I admire these musicians’ dedication, and all the efforts they put into this concert. I must say that this has been a truly unforgettable experience, and one that will definitely inspire me to visit other events of the sort. Well done!